Like most members of the first generation of American Modernists, Charles Demuth spent long periods in Paris, where he came into contact with the avant-garde literary and art circles. He soon became particularly receptive to all kinds of influences, which he assimilated in an intelligent blend of European references and characteristically American subject matter. During his first stay in the French capital, in 1907, he had been attracted by Fauve painting, whose colours and expressive forms influenced his artistic beginnings. On his second visit in 1912 he discovered Cubism. During this period he frequented the company of fellow American painter Marsden Hartley, who introduced him to the New York circle of Alfred Stieglitz. On returning he made illustrations for Émile Zola’s Nana, Henry James’s The Turn of the Screw and Edgar Allan Poe’s The Mask of the Red Death, and his linear style earned him considerable prestige. The Primrose is a delicate and strange painting in small format that is quite unknown. It depicts one of these plants in a clay flowerpot viewed through a window. The vertical and horizontal wooden bars of the window frame convey a certain idea of order, while the off-centre position of the plant adds a touch of mystery to the composition. 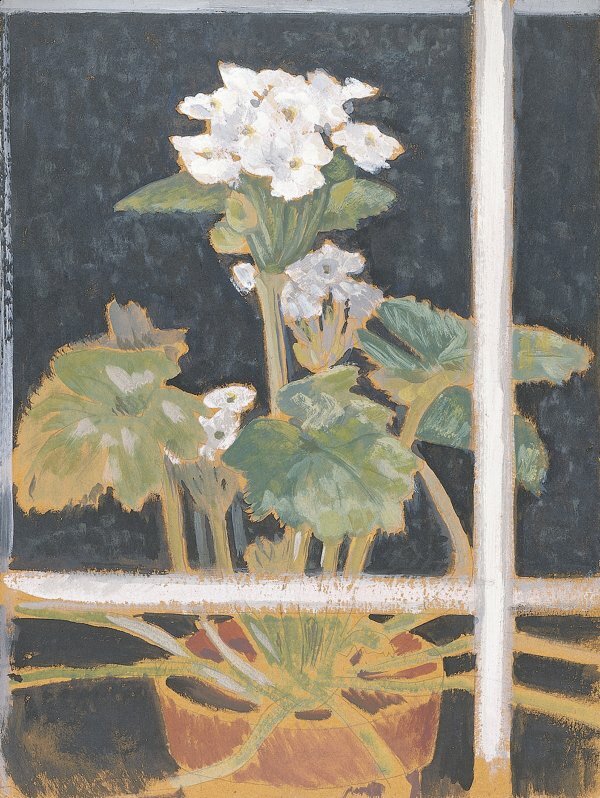 The dark background suggests that the primrose is in an indoor setting, positioned next to the glass to receive the light, and that we are therefore viewing it from the outside. The painting is less precise, with more blurred contours than the rest of the painter’s compositions, though it is one of the most visually arresting. The colour is restricted to a palette of blacks, grayish greens and various yellow and orange tones, and attests to the formal concerns the artist had learned from Cézanne. The work belonged to a collector from Columbus, Ferdinand Howald (1856–1934), who gave it to the Columbus Gallery of Fine Arts, where it remained for several decades.